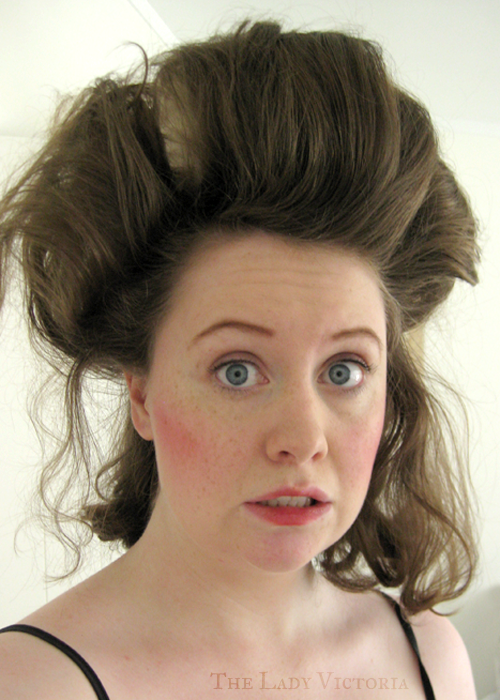 If there's one thing the late 1700's is known for, it's giant hair. For a general overview of the makeup and hair of the 1700's, Kendra of Demode has an excellent and well researched post that covers the main points of each decade. I used it to base my hair and makeup experiments here. 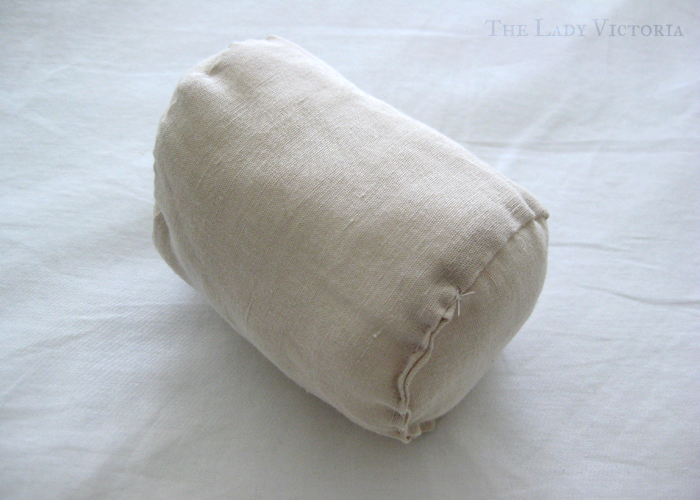 I wanted to try a late 1770's or very early 1780's pouf. Called a "transitional pouf" by Kenda, it doesn't have the height of the earlier poufs. 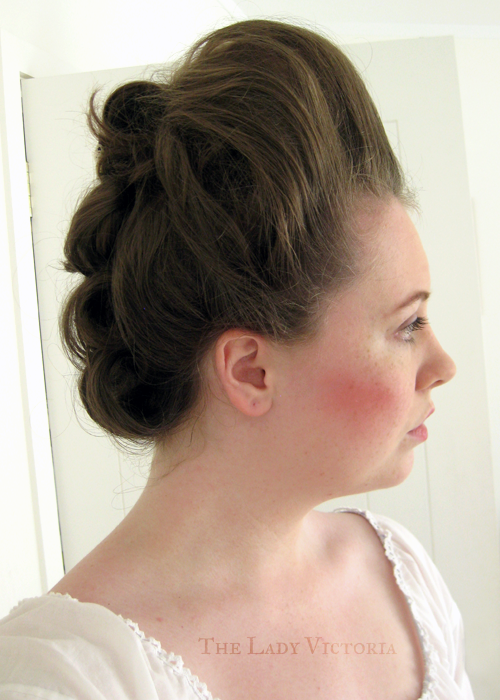 The 1780's hedgehog hairstyle looked much more complicated, so I decided to start small. A few months earlier I had made a hair rat out of cotton and polyfill stuffing. 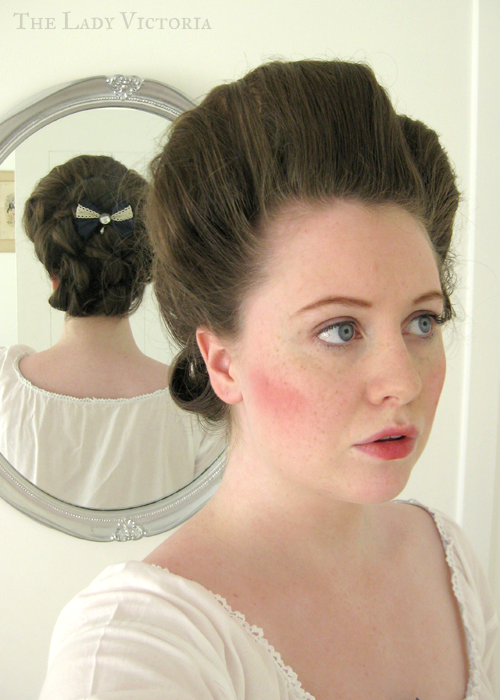 I got the idea from Two Nerdy History Girls post on achieving 1770's hair. I did this on hair that was a day old, and I had it in a 1960's beehive the day before so it was thick from backcombing and hairspray already. I pinned the rat to the centre top of my head, making sure I had lots of hair in front of it. I backcombed most of the hair on the front and side of my head, then used the very front pieces to smooth over the backcombing. I tried to give some width to the pouf by including the sides in the back combing. Alternatively I could have done rolls or curls at the side. The front pieces of hair that were smoothed over were pinned behind the hair rat, then covered with a roll at the back and a bow. There were a lot of gaps, particularly on the sides, which had trouble staying in place. 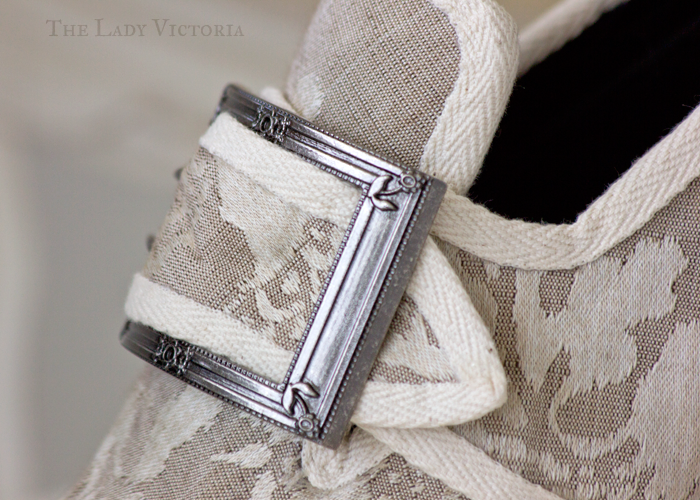 The overall silhouette looked very close to a low 1770's pouf though, and I was happy that it was working. The back was tricky, since I couldn't really see what I was doing and my arms were starting to ache! I tried to replicate the long sausage rolls that are often stacked at the back of poufs, but they ended up a bit short and messy. If I had more patience and backcombed more they might have turned out better, but the long rolls are still a mystery to me. 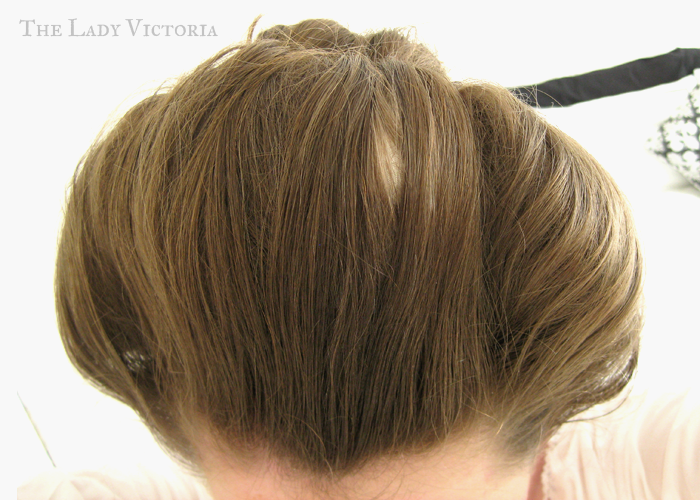 In some pictures you can see how the front of the hair had started to split at the hair rat, turning into three distinct sections. The barrel shape of the rat was too tall at the sides, so i'm going to make another one with sloped edges. I didn't use pomade in my hair, or any powder this time around. 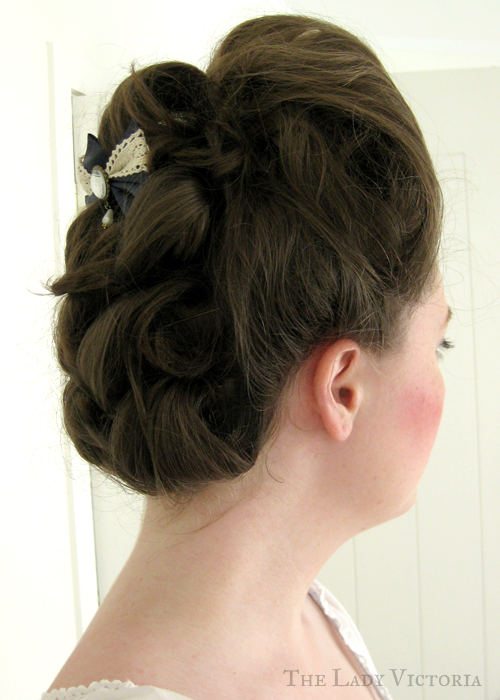 Since I do vintage hairstyles most days i'm used to backcombing and hairspray, so that's what I used here. With some feathers and bows, or a nice hat, this would be a passable 1770's hairstyle I think. My makeup was simple. I didn't use any foundation as I had none pale enough, I only used some pale powder to get rid of shine. I darkened my eyebrows slightly and made them rounded, but still kept them looking natural. I darkened my eyelids a tiny bit with some dark red eyeshadow. 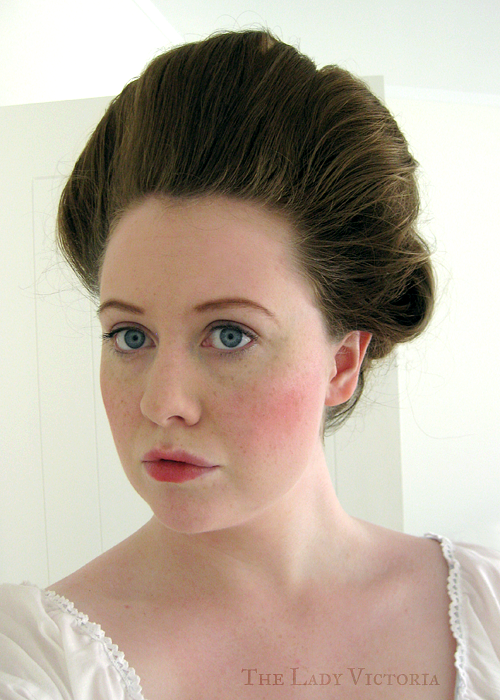 It's debatable if 18th century ladies did use red on their eyes, or if it's just the contrast of the white foundation. Since my eyelashes are blonde I used a little bit of mascara. I used lots of pink blush on my cheeks, since I didn't have red. 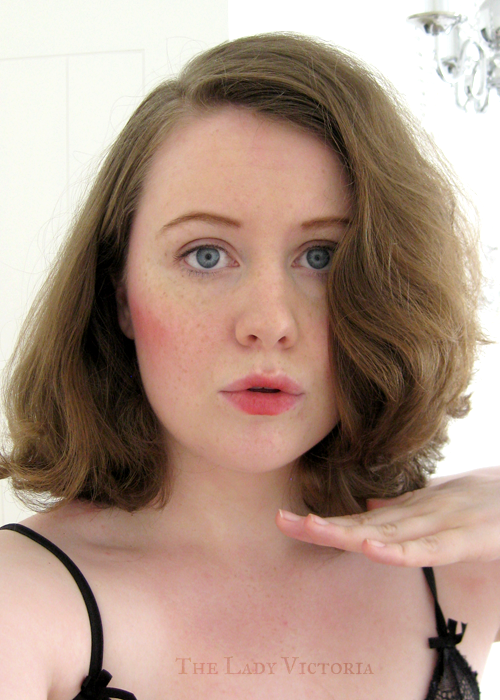 That wasn't quite cutting it though, so I used red lipstick on top of the blush. On camera only the lipstick shows up, the blush covered more of my cheeks and looked more blended in real life. I also used the red lipstick for my lips. Looking back at some portraits, I should have filled in all of my lips instead of doing a more natural looking stain. Some clear lipgloss might have also helped get that plump, cherubic ideal. I definitely need more practice, but i'm so happy with how this experiment turned out. A new hair rat shape and more patience will go a long way. You can see the hair sections splitting clearly in the above picture, and the hair rat showing through! Taking it all apart was easy, even though it seemed pretty stable. I decided to see what I could do with my own hair before I thought about wigs. The front of my hair is a weird mix of brown, blonde and red-ish anyway, so blending it into a wig would have been tricky. For reference my hair is just touching my shoulders and not layered, with a naturally wavy texture. I felt like I had more than enough hair for this small pouf, so this is probably possible with shorter hair.